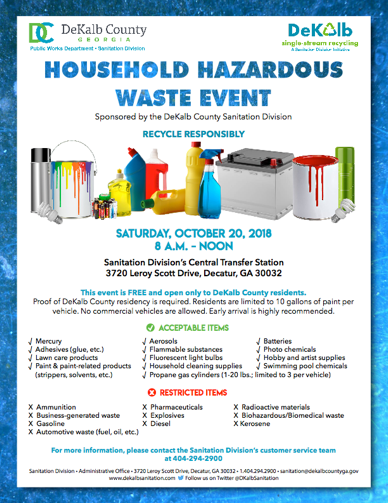 Here’s some good news for some hard to recycle items: DeKalb County is sponsoring its Annual Household Hazard Waste Event on Saturday, October 20, from 8 am to 12 noon. Note that proof of DeKalb County residency is required, as this is open only to DeKalb residents. Please review the flier or call the Sanitation Division at 404-294-2900 with questions. Emory Point will also have a Hazardous Waste Collection Event, likely in November. Stay tuned for more info on that coming soon. No Farmer’s Market on Tuesday, 10/9 – it’s Fall Break and students are off. The Market will return on Tuesday October 16 with a generous fall bounty of summer’s goodness. “Hard to Recycle” stations at Emory: Did you know that there are building locations where you can recycle glass, CFL & LED bulbs, aerosol cans, batteries, ink-jet and toner cartridges, and clean styrofoam (no food)? Woodruff Library has a set just inside the loading dock doors, the Computing Center at Cox Hall has a set on the rest room side on the 2nd floor, and other buildings around campus can be found at https://www.emory.edu/emoryrecycles/recycling/index.html – select the first link below the pick list for the spreadsheet. 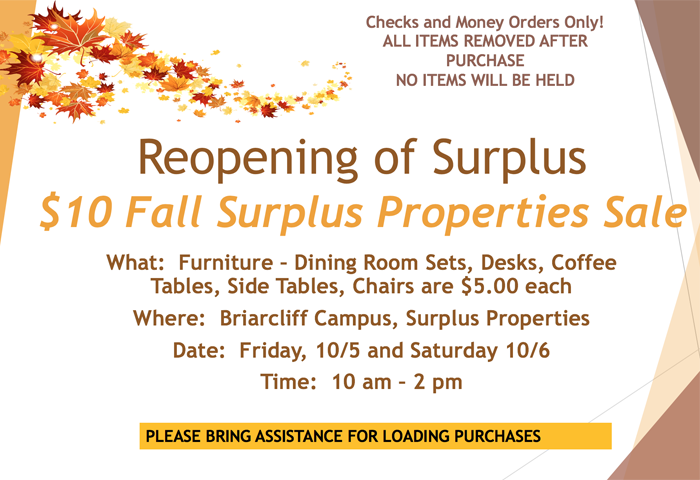 Fall Surplus Properties Sale – There is a surplus furniture sale at Emory TODAY and TOMORROW only! Go to Surplus Properties (1256 Briarcliff Rd NE, Atlanta, GA) on the Emory Briarcliff Campus between 10 and 2 pm for some amazing deals on used Emory furniture.